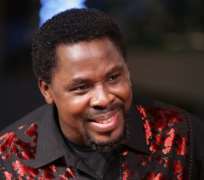 A gang of con artists that specialise in using the name of Prophet TB Joshua in bilking people out of large sums of their hard-earned money was, penultimate Sunday, exposed at The Synagogue Church of All Nations, SCOAN. One daring and long-running escapade of the crooks came to a dramatic end when their victim, Felix Doye Yabrifa, finally smelt a rat. The Bayelsa State based businessman was reacting to the constant warning broadcast on SCOAN's satellite television channel, Emmanuel TV, alerting viewers to the menace of people and churches who bandy the prophet's name about for dubious purposes. He decided on a fact-finding mission to The Synagogue after repeatedly hearing the warnings. First, he took them to his home where their initially proposed three-day stay stretched to a whole three weeks. Next, he moved them to a hotel. But a nightmarish four year spell for the hapless businessman was only just beginning. Eventually, well over three million Naira of his cold, hard cash simply went down the drain during the whole ordeal. It was as if the conmen had put a hex on Yabrifa. Willy-nilly, for eight months, he just continued to do the bidding of these strangers, continuously doling out cash to pay their hotel bills and taking care of their other needs. Then, he began to run low on cash, as his bills ran up. The confident tricksters got even more daring and more diabolical. Their leader, the elderly lady, had Yabrifa believe that she was in constant touch with Pastor Joshua: “She confirmed to me that she was constantly in touch with the man of God and that they communicate in spirit on a daily basis,” narrated the businessman, who also told the congregation of worshippers at the church that the con-artists told him they the primary aim of their visit was to pray for the people of Bayelsa State and then put a stop to a refinery project that was having some financial problems. Even as he continued to take care of them, they made new demands on Yabrifa and even his France-based business partner who had waded into the matter, to bail his business associate out of his financial mess. From his partner, they demanded for N1million to be paid into their account every month, and from Yabrifa himself, that the sum of N20,000 be given them every week. When his partner heard of the new demands, he protested. On his own part, Yabrifa saw that despite all he was doing, there was no progress for the better, whatsoever. “Besides, they were introducing me to something contrary to what was happening in The Synagogue Church by telling me to provide money to buy items for them to go and sacrifice to marine spirits here and there,“ Yabrifa noted. From then on, the businessman could no longer fold his arms and swallow what he had condoned for four long years. He had also been hearing the announcements on Emmanuel TV and this heightened his suspicion. He quickly emailed The Synagogue Church to find out the truth: “When I heard the publications and broadcasts on Emmanuel TV, I became very suspicious and decided to write this very email thinking that when I come here today, at least I would know the truth,” said he, brandishing a copy of the email he had written to The Synagogue as he narrated his ordeal to the congregation. To his greatest amazement, when he arrived at The Synagogue Church that Sunday, he ran into the ringleader of the group, an elderly woman who was fingered by the victim and was quickly picked up by security agents. “Funny enough, this afternoon I saw one of them so I said well, let me put this across to the man of God.” She was brought into the church where Yabrifa narrated his ordeal, then later taken to Kaiama with her victim, where the Emmanuel TV crew videoed all the locations where the fraud allegedly took place, to corroborate Yabrifa's allegations. Finally, Yabrifa and the television crew returned to Lagos with the suspect and the rest of her gang in tow. Finally, the prophet, describing the entire saga as irritating, asked that the narration be stopped, midway into the evidence of the second suspect, a tall, well-built, well-turned out middle-aged man that looked more like a respected tribal chief, than a con-artist. He proceeded to administer prayers and deliverance on them, while thanking everyone in the audience, especially Yabrifa and the people of Bayelsa Sate, for forgiving the suspected culprits. “Let us put all this behind us,” he pleaded. Meanwhile, during the same Sunday service, a newspaper which reported in its Tuesday May 19, 2009 edition, that a woman and her son disappeared at The Synagogue Church Of All Nations, was displayed side by side the same woman who was reported to have gone missing with her son.